IMPORTANT NOTE ! REMOVU M1+A1 does not work with HERO5, HERO6, HERO (2018), and HERO7. Please do NOT buy it if you are planning to use it with HERO5, HERO6, HERO (2018), and HERO7. REMOVU M1 is a device that allows GoPro users to add high quality sound to video from distance. Using wireless communication, it can record high quality sound away from GoPro upto 10 meters without any delay. 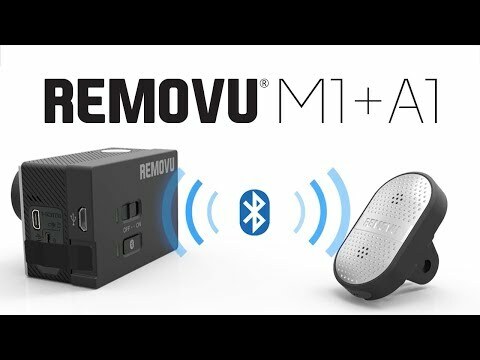 With REMOVU A1, you can connect REMOVU M1 to record rich and crisp sound. It can fit perfectly into standard GoPro bacpac housing, so you won’t need to carry around extra housing to use A1. REMOVU M1 comes with a waterproof housing that records sound even underwater. The special material we used to cover the mic holes prevents water penetration but lets in sound through it, REMOVU M1 can record sound even in wet condition.